If you live in Milwaukee and you know anything about fashion, then you should know of Keaira Monique and her vintage and contemporary fashion destination, Luxx Boutique, located in the heart of downtown on Milwaukee St. & Mason. For as long a she can remember, Keaira was a “fashion girl” and has been working as a professional stylist for the past 4 years. She and her mother opened Luxx Boutique in January 2012, and, with so much support from the city, they have hosted dozens of successful events and just recently moved to a new location last year. We have known Keaira for many years both personally and professionally, and naturally we had to be present to cover her second annual “Spring Fabulously” fashion show. 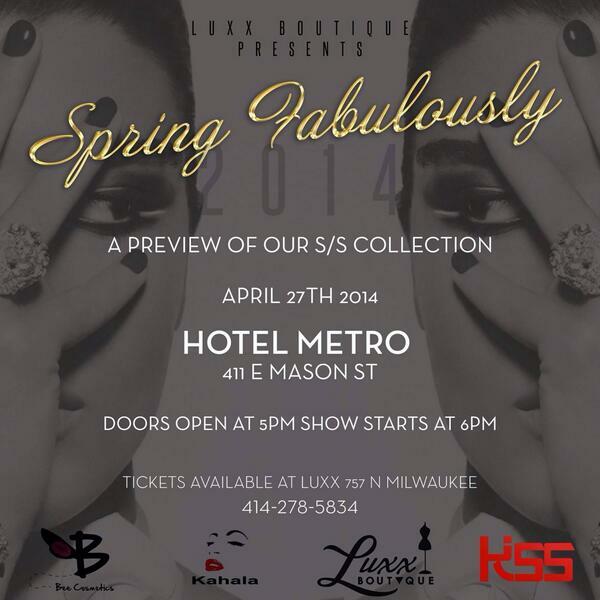 This year’s show, which was held at the Hotel Metro just down the street from Luxx, featured a preview of the boutiques 2014 Spring/Summer collection. When we arrived at the venue, we were immediately greeted with a chic, yet relaxing ambience: drinks were flowing, hors d’oeuvres were served and the music played by DJ PoiZon Ivy helped set the tone for the evening. The hotel had a vintage vibe that complimented the collection; nothing appeals to true fashionistas quite like vintage any and everything! Before the actual start of the fashion show, there were several local vendors: Bee Cosmetics showcased their latest lipstick line, Terise Linyard represented for “It Works! Body Wraps“, and Luxx offered jewelry and handbags for purchase. The pop up shop was available before and after the show, which provided more opportunities to mingle and network with other attendees. After everything settled and the lights for the runway came on to signal show time, Keaira’s aunt Nora gave a positive and motivating speech to all the dream chasers and goddesses in the room, another personal touch that surely made everyone feel inspired and fabulous. She spoke on going forth with your dreams, how special each and every one of us were and that it was very important to know that we are individuals with our own purpose. Now it was time for the beautiful models to walk the first looks of the 2014 Spring/Summer collection for Luxx Boutique! For the first set of looks, Keaira featured the Custom Collection from Luxx. Each piece had its own personality and yet the collection flowed flawlessly: from the popping pink body con dress to the cropped green top and fitted black skirt to the dramatic navy blue ruffled dress with an extended cape, any woman could easily fit these looks into her everyday wardrobe. Then came our favorite collection of the show: Vintage! This collection was well harmonized and showcased unique looks that women of all shapes and styles could appreciate. The floral silk blouse and denim shorts were right up our alley, and the West African print harem pants were another favorite of mine. Not to mention the champagne colored dress Alex wore! It was a button down vest top with a shear lapel that went into a flirty, flowing skirt . She looked gorgeous! The Kelvin Haydon & Luxx Collection was the final run through and there were so many beautiful evening dresses, colors and prints. Especially, the stunning lace dress that glided down the runway. TUH! We really don’t know where to start or end with this one, so we will let the designs speak for themselves. Overall, Keaira, the designers and the models put on a GREAT show; we walked away with multiple options of needs and wants to turn up our closets this summer. The pleasant vibe of the whole night lingered with us even after we left. We honestly felt fabulous being there and truly appreciated the whole experience. Following the amazing turn out for the show, we wanted to catch up with Keaira to pick her brain about the concept of “Spring Fabulously 2014”, her career as a fashion stylist and the future of Luxx Boutique. Coco & Butter: How many fashion shows has Luxx done so far? Keaira Monique: This past show would be our 2nd annual fashion show. I try to do them every spring. Last year was our first show, we had it in the showroom across from the [old] boutique and it was packed! I totally didn’t expect that. We had a pretty good turnout, positive feedback so we did it again this year and we upgraded to this location (Hotel Metro) and I swear I did not expect to have a packed house! I was backstage the whole time because I was making sure the models were ready and I had to get myself together so I didn’t see everybody until I actually walked out at the end. So for this to be our second year, like, the city is f***ing with us. C&B: We loved the venue, it gave off that vintage vibe. Everything about it was great. C&B: So, since you stated that you did a fashion show last spring, is there a reason why you chose spring over fall? KM: Well actually last year we were looking to do a show as our one year anniversary [January 22nd] but you know how long it takes to plan shows so we didn’t end up doing it until about March so I was like ‘Lets just put together a spring/summer collection’ and it happened like that. So this year we just ran with it again. KM: Its crazy because it wasn’t like–you know, people plan shows for like 6 months–we probably started with the ideas in mid-December, locked in the venue in mid-January–so probably 2 and a half months. I wouldn’t suggest it to anybody else [laughs]. I’m good at working, like, last minute sh*it. I don’t know it always ends up coming together, I work under pressure so I can throw something together in 2 months. C&B: What was the most time-consuming part about planning this fashion show? KM: Probably getting the clothes together. We showed the custom collection, a vintage collection and our collaboration with Kelvin Haydon so, you know, meeting with the designer making sure whatever he’s making will fit within the show and the story. The customs–with the seamstress, its pretty much me getting the fabric, me coming up with the ideas and just working back and forth with her; that was time consuming. Then my vintage girl, she goes out and buys stuff and then brings me a ton of sh*t and then we just pick the collection from there. So definitely the clothes because hair, makeup, models and all of that, thats nothing, I handpick them. KM: I don’t want to say that. C&B: Well, you made the concept basically for the pieces. KM: Yeah, but I am not going to ever say that I design [laughs] I ain’t claiming that. I don’t want to be a designer, so I’m not even going to–I just got the seamstress and told her what I want, so in my eyes I don’t think thats designing because I am not a designer. I don’t have that skill, so sh*t , I’m just happy that came out right because you never know, you know? I just stay in my lane: I’m a buyer, I’m a visual merchandiser, I’m a stylist, and then thats that. People gotta learn to stay in they lane. Know what you’re good at, know the skills that God blessed you with and stay in your lane. C&B: Exactly. So what do you enjoy most about getting prepared for a show? KM: Fashion. Because I’m a fashion girl, thats my lane so I definitely enjoy, handpicking my vintage pieces because thats where my heart is. Jazmine knows, day one, Luxx is about vintage. We started the business with just a ton of sh*t out my closet, so picking the vintage that was my favorite part. I knew Kelvin was going to do his thing and the [seamstress] but just dealing with vintage clothes, it just really makes me happy. C&B: What made you choose to collaborate with Kelvin Haydon for spring fabulously? KM: I mean, its a no-brainer. If you look at designers in the city, his craftsmanship, his work ethic, I mean just the way he designs and the way he makes clothes to fit me perfectly. [She pauses.] That’s selfish for me to say that because it’s not about me [laughs] but he makes clothes to fit your silhouette like crazy so it just was like, I want to work with the best. I’m striving to be the best that I can be and I like to work with quality people who have good work so that collaboration happened effortlessly. KM: That gown was everything. My favorite piece from the Vintage collection–I liked a lot of them: the demin [shorts] Tish had on with the blouse, and the look Sinceree wore: the plaid pleated high-waist skirt with the black, semi-sheer crop top and another model wore an all black pleated skirt with a black leotard tucked in. I just think that high-waist pleated skirts, like calf-length are just really chic. I think thats going to be a trend we carry in [Luxx] so yeah, the vintage pleated skirts were like my favorite. And then from the custom collection–I’m simple when it comes to my custom looks, so the mustard ruffled midi dress that Tish wore. Thats my favorite color so I love that look. C&B: For up-and-coming entrepreneurs that want to look into owning their own boutique, do you have any advice for them? KM: I would definitely say make sure you have all of the right resources you need before you start. Make sure you have a good drawn out business plan; if you can, try to have some good funds put up because its a lot, you know. I started off–I didn’t take a loan out or anything, I did it with my own money so I wouldn’t suggest that anybody else tries that. If you can maybe get an investor or a loan and pretty much just have a plan and stick to it. C&B: What do you see in the future for Luxx? KM: I would like to branch out to a couple different cities, I eventually want to open [a boutique] in Chicago because thats my hometown, and possibly Atlanta too. C&B: And what’s next for you? KM: Man, I got a lot of good projects coming up! Definitely just taking my styling to another level because thats my first love, that’s how Luxx started. Luxx was supposed to be my showroom to keep the clothes that I use for my clients but, me styling, me working as a Senior Fashion Editor for KISS Magazine, branching out and working with this company called Hawke & Dumar that’s based out of New York. We were in Atlanta like a month ago and we had an event called “The Pop Up Shoot”. Hawke & Dumar brought their spring collection, and he had a lot of heavy hitters as far as DJs, producers, rappers, a lot of guys in Atlanta modeling his clothes and I styled that [Check out the video here]. Then I just got a couple new clients that I’m working with that I really think are going to help me get my styling at that level that I want it to be. So just me building myself as a stylist and expanding to other cities. I’m really trying to bring something dope to Milwaukee, fashion and music. I’m not just doing this for me; its not about me, its about bringing this to the city. Luxx is located on 727 N. Milwaukee Street and is open Tuesday – Saturday from 12-8 PM, and Sunday from 12-6 PM. Every Friday, Keaira hosts a “Sip & Shop” in which customers can enjoy music and cocktails while they shop, and receive 50% off all purchases. In early June Luxx will once again be participating in the Third Ward’s Gallery Night during which they will feature local artwork. If you’re looking for something new and different, make sure you stop in and pay Luxx a visit! There’s truly something for everyone and no one will leave looking the same.